Are you headed to a sewing retreat or class where you need to bring your own thread? Do you need a dust-free, secure place to store your embroidery thread at home? If so, then we have just what you need! 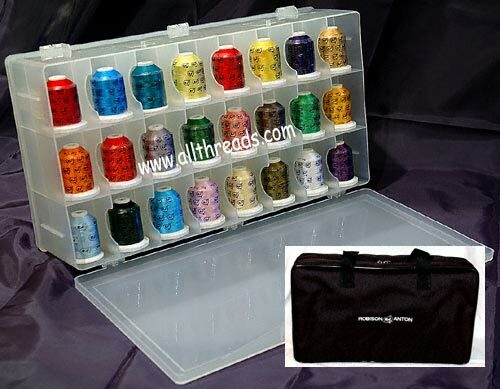 This Robison-Anton 48-spool plastic thread caddy is specifically designed to accommodate Robison-Anton "Mini King" embroidery thread spools (including the new, wider "Snap" base spools) and holds 24 spools on each side, for a total of 48. It's made of durable high-impact plastic and will keep your thread clean, safe and secure. It also comes with a great black canvas carrying case with handles and an optional shoulder strap. The carrying case has a zipper to allow easy access to the thread caddy, plus an interior zippered pocket for storing small items such as stabilizer, design cards, CD's, etc. The individual spool compartments measure 1-15/16" wide by 2-13/16" tall. This product has been discontinued by Robison Anton.